Snippets of Jack: "You Knew My Father"
#Flashbackfriday! Ok, not really. This isn't twitter or instagram. (Speaking of which you should really follow us at @snippetsofjack). Regardless, we are still going back in time to when Will didn't know who his father was. Jack breaks the news to him in a rather harsh way in The Pirates of the Caribbean: Curse of the Black Pearl. They miraculously make it off of Tortuga alive on thier own ship, the HMS Interceptor. Men really bond when they are forced to man a whole ship on their own. Will: "When I was a lad living in England, my mother raised me by herself. After she died, I came out here, looking for father." That's actually when we first see Will. He's a little boy on a ship with his father's piece of gold around his neck. The Black Pearl under Barbossa attacked his ship on the way out to find it, but ended up leaving with out it, not knowing Will had it. Jack is really intirgued by Will's life story, NOT. Jack: "Is that so?" But Will isn't willing to drop the subject. Will: "My father, Bill Turner? It was only after you learned my name that you agreed to help. Since that's what I wanted, I didn't press the matter. I'm not a simpleton, Jack. You knew my father." No, I am your father! Heehee. Imagine being the son of Jack Sparrow. Wouldn't that be nice. Seeing as he can't get out of this one, Jack reluctantly carries on the conversation. Jack: "I knew him. Probably one of the few who knew him as William Turner. Everyone else called him 'Bootstrap' or 'Bootstrap Bill'." Will is confused: "Bootsrap?" What kind of a nickname is that? It's a pirate one I tell you! Jack: "Good man. Good pirate. I swear, you look just like him." It's so like Jack to add that little phrase after it to try to lighten the mood. Now it's Will's turn to not really feel it. Will: "It's not true. He was a merchant sailor." THe irony here is great. Boy who hates pirates is actually the son of one! I wonder if Beckett is the son of a pirate too. Just kidding, we alreayd discussed how his father was a jerk buisness dude. Will: "A good, respectable man who obeyed the law." How exactly would ynou know. Unfortunately, you have no memory of him. Jack rolls his eyes in annoyance. I'm really feeling the friendship bonding here. 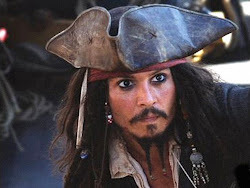 Jack: "He was a bloody pirate, a scallywag." Considering Will is actually currently teamed up with a pirate, I'm not so sure how hte cant talk about how pirates should be avoided at all costs. Will just takes things to a whole new level. He pulls out his sword angrily and points it at Jack, who is actually steering the ship. Kinda dangerous . . .
Will: "My father was not a pirate!" Jack is just exasperated. Jack: "Put it away, son. It's not worth you getting beat again." Will: "you didn't beat me. You ignored the rules of enagement. In a fair fight, I'd kill you." It's true. Will certainly does have quite the skill with a blade. Jack: "That's not incentive for me to fight fair, is it?" Another true point to Captain Jack Sparrow! Jack is done with this and would like to get to Tortuga quickly without any more interruptions so he turns the wheel abruptly which makes the mast turn sharply, hitting Will and making him dangle over the open sea. Jack is going to assert his power once and for all! Jack: "As long as you're just hanging there, pay attention. The only rules that really matter are these: what a man can do and what a man can't do. For instance, you can accept that your father was a pirate and a good man, or you can't. But pirate is in your blood, boy, so you'll have to square with that someday." Oh turst me he does. Especially when he bcomes a pirate and ends up meeting his pirate father! Then they end up both being pirates together on the Flying Dutchman, but in the mean time Will is still in denial. Jack: "Now, me, or example, I can let you drown, but I can't bring this ship into Tortuga all by me onesies. Savvy? So." He uses the wheel to bring Will back on board. Will falls on his back onto the deck. Jack puts his sword out above Will's chest. Jack: "Can you sail under the command of a pirate?" He flips the sword around so that he is holding the blade (ouch) and the handle is extended towards young Turner. Will timidly accepts the sword. Will: "Tortuga?" Will: "Tortuga." Because you're not really a pirate until you've enjoyed the "beauties" of the not-so-lovely port of Tortuga. BTW, what is your thought on Will Turner possibly returning to POTC5? From what I've seen on the web, people are mixed on if it should happen or not. Though I somehow think he shouldn't come back because he had to serve aboard the Dutchman for eternity, or something like that. Sorry if this is off-topic but I'm curious. I think that his addition would make the final installment all the more epic! He could always be still on the Flying Dutchman. Thank you so much for your interest! -Do Something Jack Would Do Today.